Women on a Mission: Mom Edition: DOUBLE-HEADER FRIDAY: ROYAL WEDDING: Part 2! And speaking of that engagement ring, Thrifty Nana tracked down two replica rings (in sterling silver even) for us to wear on April 29. I am THRILLED. I won’t reveal what she spent, but let me tell you that she shopped around and found a great deal. We will wear the rings, and since I’m pretty sure I’m 10x more beautiful and 10 lbs. slimmer in my mind than in reality, I truly will feel like a princess that day. For now, the girls will have play pearls and gems. I have to say that this is a pretty impressive play necklace. First, you cut a 1½” piece of beading wire and bend it into a loop; string a pearl through both ends; push it up to the end of the loop so just a bit is still sticking out. 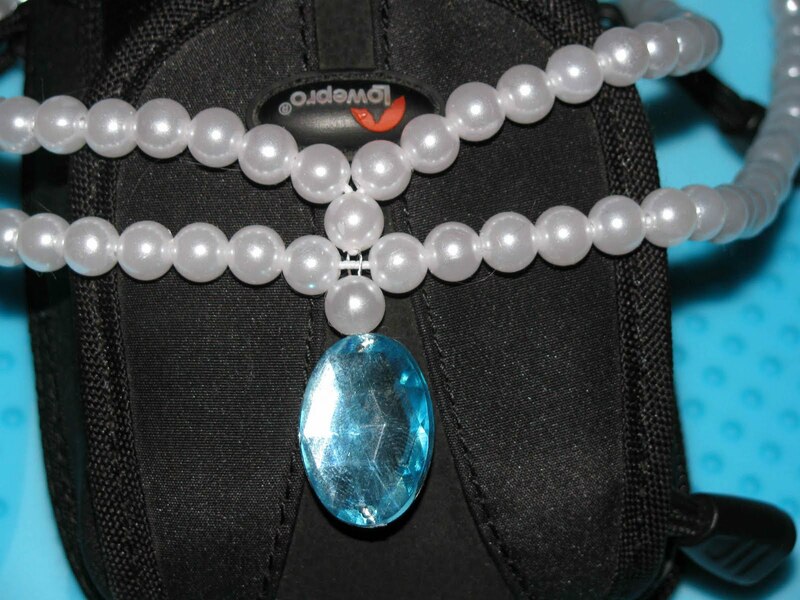 Glue the ends of the beading wire onto the back of one of the blue gems, with the pearl butted up against the top. Sandwich the other pearl onto it with glue. [I used super glue around the beading wire, then a big dab of glue gun for the bead sandwich.] I’m sorry I don’t have a picture of this. It didn’t work to take a picture and hold the wire onto the gem at the same time without it coming off. See the mini loop of wire sticking up out of the pearl. Next, you cut two pieces of beading elastic*. 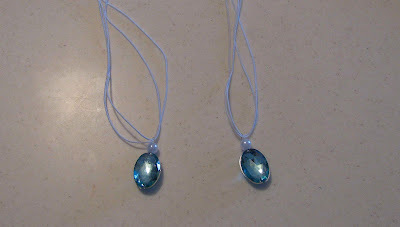 I cut mine to be 18”, which is 6” longer than the length I planned for the finished necklace. I used a necklace the girls play with so I knew it would be the right length. 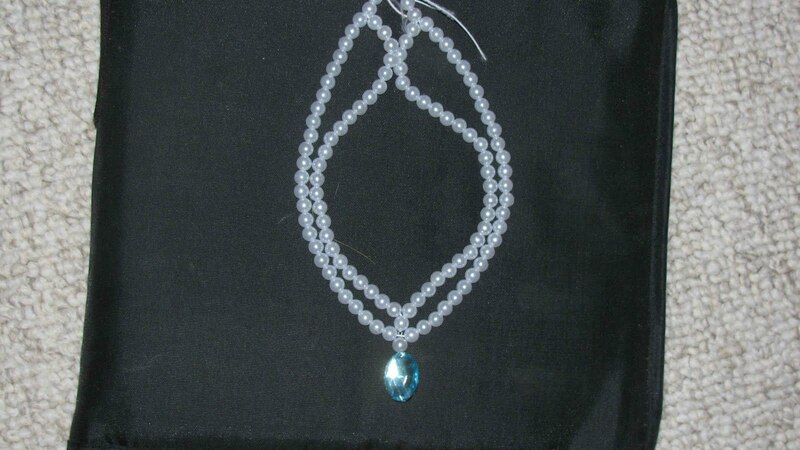 String both lengths of beading elastic through the little loop sticking out of the gems. 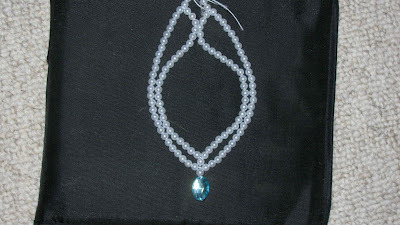 Of the piece that will form the upper segment of the double-pearl necklace, combine both ends and string a pearl onto both, then pull the pearl down to the center (*this was a serious fete with that beading elastic – much easier with the beading wire – see more on this below). String pearls onto all four pieces of the beading elastic. Secure one beaded side with a piece of tape while working on the other so the beads don’t slide off. When you have the beads to the length you want, put both pieces of elastic on each side together, put a couple of pearls on the joined ends, then secure the magnetic clasp onto it. Trim the ends. Do this for the other side and it’s ready to wear! It’s a really cute necklace. My girls are superstar princesses. They’ll never know that it’s not a real crown jewel. And I’m not telling. PS - thanks to being giveaway winners on Smashed Peas and Carrots recently, I ordered fascinators for each of the girls from Nicole at Sassy Heart Tutus, which just arrived. I plan on having them wear them for Easter, and I'm excited to share with you. FYI, fascinators are the headpieces Brit ladies wear to weddings and other formal events that have fluffy feathers sticking out of them. A must-have for my two princesses.